How do we teach and learn vocabulary? How do words work in literary texts? In this book, Ronald Carter provides the necessary basis for the further study of modern English vocabulary with particular reference to linguistic descriptive frameworks and educational contexts. 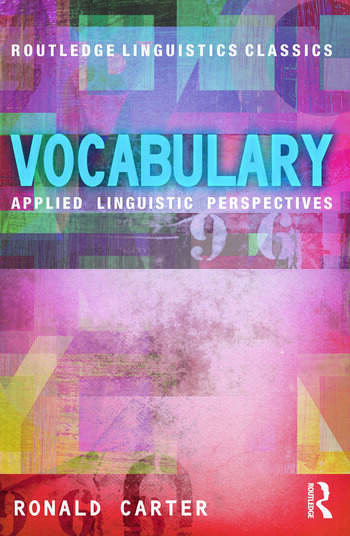 Vocabulary: Applied Linguistic Perspectives includes an introductory account of linguistic approaches to the analysis of the modern lexicon in English and discusses key topics such as vocabulary and language teaching, dictionaries and lexicography and the literary, stylistic study of vocabulary. This Routledge Linguistics Classic includes a substantial new introductory chapter situating the book in the current digital age, covering changes and developments in related fields from lexicography and corpus linguistics to vocabulary testing and assessment as well as additional new references. Vocabulary: Applied Linguistic Perspectives has been widely praised since first publication for the breadth, depth and clarity of its approach and is a key text for postgraduate students and researchers studying vocabulary within the fields of English Language, Applied Linguistics and Education. Ronald Carter is Professor of Modern English Language at the University of Nottingham, UK and has written and edited more than 30 books, including most recently Language and Creativity (2004, Routledge). He is the author and editor of twelve books with Routledge, and has edited and co-edited five Routledge series.